Congratulations, you are getting married! Your special day should be perfect in every way, and I can help you to achieve your dreams. Being a leading Global Wedding Officiant I pride myself on being able to create the ceremony that is perfect - just for you! Any location in the world. Please see FAQs with regard to Fees. In Warwickshire, UK, at a beautiful countryside location I legally marry couples - without restriction on religious or spiritual content. One 'silent' Registrar will be present throughout the ceremony to witness and scribe. Emma & Alistair's Wedding at Blenheim Palace. I will do everything I can to make sure that your ceremony is exactly what you want it to be. Patrick and I recently 'eloped' and married on a beach in Northern Ireland. David was very professional and always available & ready to help. 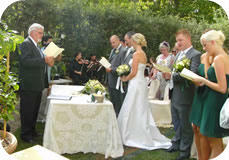 We highly recommend David, of Creative Ceremonies, to all couples wishing their dreams to become reality. ♥ Time - Whatever time of day or season of the year that you choose, spring, summer, winter, fall, sunrise, sunset or by candlelight, I will work with you to design a ceremony that runs to your exact timings. ♥ Place – Wherever your choose to have your ceremony, i.e. home, garden, church, beach, lake, forest, hot air balloon, historic site or other venue, I can make it work for you, so that you have the perfect location to share with your family and friends. ♥ People – Whether it's an intimate gathering for your closest family and friends, a guest list of hundreds or you want children and other guests to be an integral part of your ceremony, I can help you to achieve a unique day that actively involves the people closest to you. 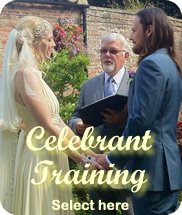 ♥ Words - With no set rules or restrictions for your special day, I can help you prepare meaningful vows and choose readings, poems and songs, which are personal and have special significance to you both. ♥ Style - Whether you want to be married barefoot in a romantic ceremony on the beach, or in your finest formal clothes in a traditional church ceremony, I can help you to create a meaningful and momentous occasion that both fit and compliments your unique style. Finally as your wedding officiant I never lose sight of the fact that the day is your day. So whilst I am on hand to help you, you will always have the final say on all aspects of your wedding or commitment ceremony. Allow me the privilege of being your Wedding Officiant. Call me now to discuss how I can make a difference to your special day. Our wedding ceremony was a very personal and emotional ceremony, and we couldn't have asked for a more perfect day. David was very professional, approachable and invaluable throughout the whole planning process. He was always available over the phone, skype or email, which for us was ideal as we live in Italy. He offered lots of great and unique ideas, and really got to know everybody involved. We highly recommend David to any couple looking to make their dreams, of the perfect and unique wedding ceremony, come true.